Roll up your dinner with easy-to-make pan bread. 1. Place all the marinade ingredients in a bowl and stir to combine. Add the pork to the marinade, cover and leave to marinate for 30 minutes or overnight in the fridge. 2. Pan bread: Sift the flour into a mixing bowl and slowly pour in the water, stirring continuously. Mix in the oil when the dough is cool enough to handle, knead for 5 minutes or until smooth. Cover with a cloth and leave to rest for about 30 minutes. 3. Remove the dough from the bowl and knead a few times. Divide the dough into small balls and flatten into thin discs. 4. Warm a nonstick pan over medium heat and fry each pan bread on both sides until it starts to brown and bubble slightly. 5. Sauce: Heat all the ingredients except the corn flour paste in a pan. When the sauce starts to bubble slightly add the corn flour paste and stir until thickened. Set aside to cool. 6. Remove the pork from the marinade. Heat oil in a frying pan over medium heat and fry pork until browned, about 5 minutes. Transfer to a baking sheet and bake for 15 minutes or until juice runs clear. Slice thinly. 7. 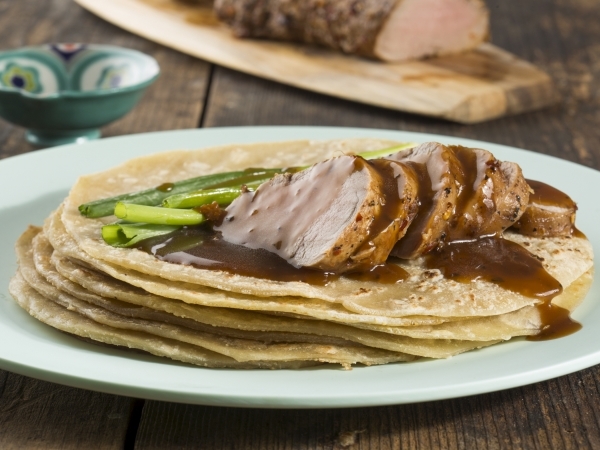 Serve the pork, pan bread and spring onions in separate dishes with sauce on the side. To assemble, place a pan bread on a plate and top with pork, sauce and onion. Roll it up and munch.